Leading international shower designer and manufacturer, Roman, have won the prestigious consumer safety award for compliance in bathroom products at the renowned NHIC Awards black tie ceremony. Roman won the prestigious NHIC Award for innovation and initiatives to promote consumer safety through compliance in bathroom products and installation. 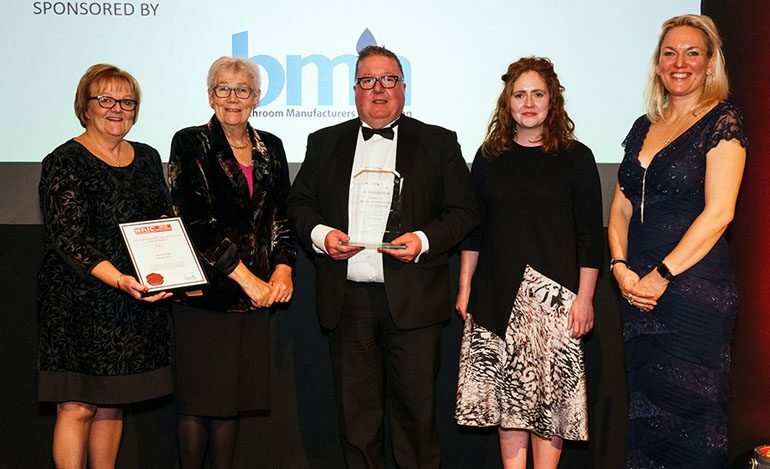 The award focussed on Roman’s product safety and particularly on the ongoing promotion and communication of CE Marking at all stages of product communications in all channels. The awards ceremony was a prestigious event held at the spectacular Whitehall Place in London. Since 1974 the NHIC Awards have recognised achievement in UK housing and have grown over the years to become highly regarded as the premier event in the home improvement and modernisation sector. • Pictured (above): Yvonne Orgill (CEO, BMA), The Lady Baroness Maddock, David Osborne and Laura Knox (Roman) and Anna Scothern (executive director, NHIC).